[BB-Blog]: An abandoned Russian library. I wish I could read Russian to trace this link back and find out more about it. my russian is superbad (especially for someone who took russian classes for 8 years! 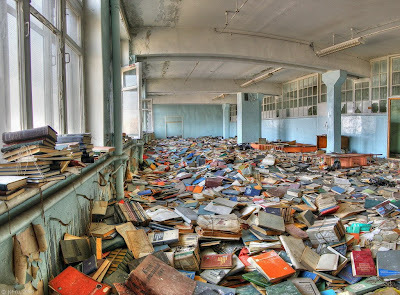 ), but that's the library of an abandoned technical secondary school and those are old science and technology textbooks and marxism-leninism books. this is tschernobyl like it was left in 1986 :-( you can nowadays visit the city for a daytrip. the library (like the carnival or swimhall as well) is a famous spot to go for those who are attracted by lethal scenes like that. Both previous comments are correct but for future reference, google translate is a great help when I'm researching ruins in other countries. If you use google chrome browser it will offer you the option when you're on a website displayed in a language outside your settings, it will offer the option to auto-translate the entire page for you.